The Sprint Tri provides an excellent novice challenge with diverse terrain, incredible scenery and virtually no car traffic on both the bike and run! Swim in Folsom Lake at Rattlesnake Bar State Park, enjoy quiet roads, very beautiful bike course and the tranquility of a run course entirely closed to auto traffic and stunning canyon views at seemingly every turn. Enjoy the incredible beauty of this one-of-a-kind course in a convenient & hospitable town. 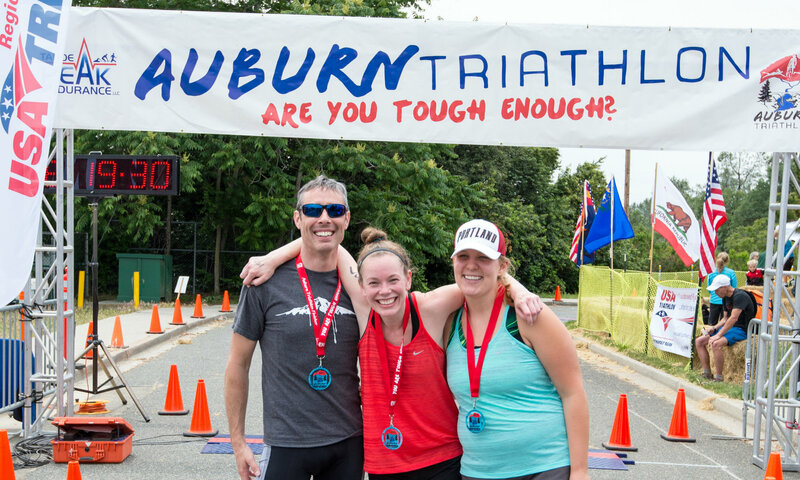 Make Auburn a destination for your training and race weekend! Relay teams will go in last wave. Be sure to listen to race day announcers important announcements throughout the day. This is a two-transition race! The lake is 7 miles from the finish line in Auburn. We recommend you check out our Transition Logistics for detailed information. You can park at the lakeas autos will be allowed into the park near lake, but NO AUTOS CAN LEAVE the lake until the final cyclists leave ( ~ 9:30). There is no return shuttle service post-race. For those driving down or getting dropped off, please drop off at the parking area above the boat launch. T1 is a CLEAN Transition which means, after your swim you need to PUT EVERYTHING INTO YOUR BAG so that we can haul it up, anything not in a bag completely, will be thrown in a lost and found pile for you to look through at T2. Please, take the time to pack it in. Help our volunteers get all your stuff back safe and sound to T2/Finish. Please dispose of your used water bottles off the roadway in the immediate vicinity of the aid stations. Note: You are running in a state park and litter is strictly forbidden. Carry your used gel packets and other stuff to the next aid station’s garbage. Anyone seen purposely littering on the course will be disqualified and sentenced to hard labor in the state park (clearing poison oak by hand wearing running shorts and singlet). Check out our website for more details of aid station locations. Port-o-Pottys will be available at the two bike aid stations on the bike course and at the T2/Finish/Run Start. For the run course there will be Porta pottys at Upper Dam and at T2/Overlook. Bicycle Emporium will be our bike mechanic sag wagon. Lost and Found: If you leave or lose anything race day please check at T2/Finish area where all the swim transition bags have been placed from being hauled up from T1. Your shoes if you left any will be there in a pile for you to search for as well as anything else that was left loose at T1. You must leave T1 with all things in your transition bag or the bag that is provided with your name and number on it. Anything left loose is considered lost and found. If you want anything returned to you we will be happy to do so but at your expense. After 2 weeks, it goes to the good will. What if I miss Saturday registration? If you can’t arrive until Sunday, you can get your chip at the lake Sunday morning. You can obtain your goody bag with shirt after the race but Sundays’ pick up does not guarantee your shirt size no matter when you registered. You can receive by mail if you agree to pay for shipping as a courtesy. Remember you must bring your USAT card and Photo ID and bring cash or check only will be accepted if you need to purchase a 1 day USAT license. (no credit cards) USAT rules apply! US A Triathlon provides comprehensive insurance coverage to sanctioned events. The coverage provides liability coverage to protect the race director, sponsors, volunteers, officials, and participants. The athlete excess medical coverage protects each participant for the day of the event.